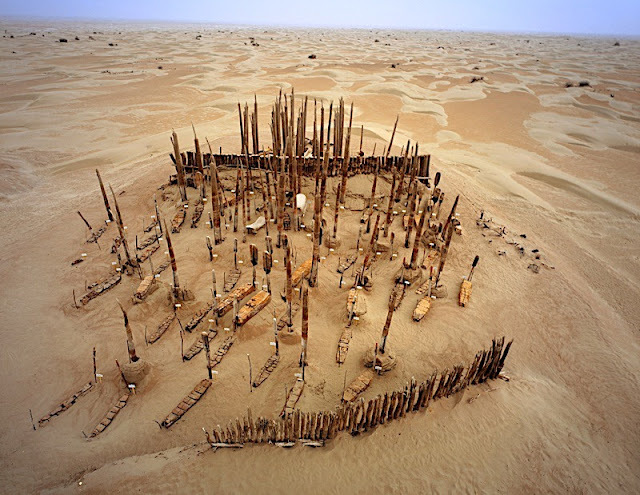 In the far eastern edge of the desolate Taklamakan Desert, hundreds of kilometers from the nearest settlement, a clump of dense wooden stakes mark the spot of a 4,000-year-old cemetery. The cemetery lies on top of a small sand dune. The wooden posts, whose tops have been splintered by centuries of strong wind, are the tombstones of those who lie buried beneath. The dry summer and frigid winters have helped preserve the bodies to such an extent that one can still see the features and contours of their faces. 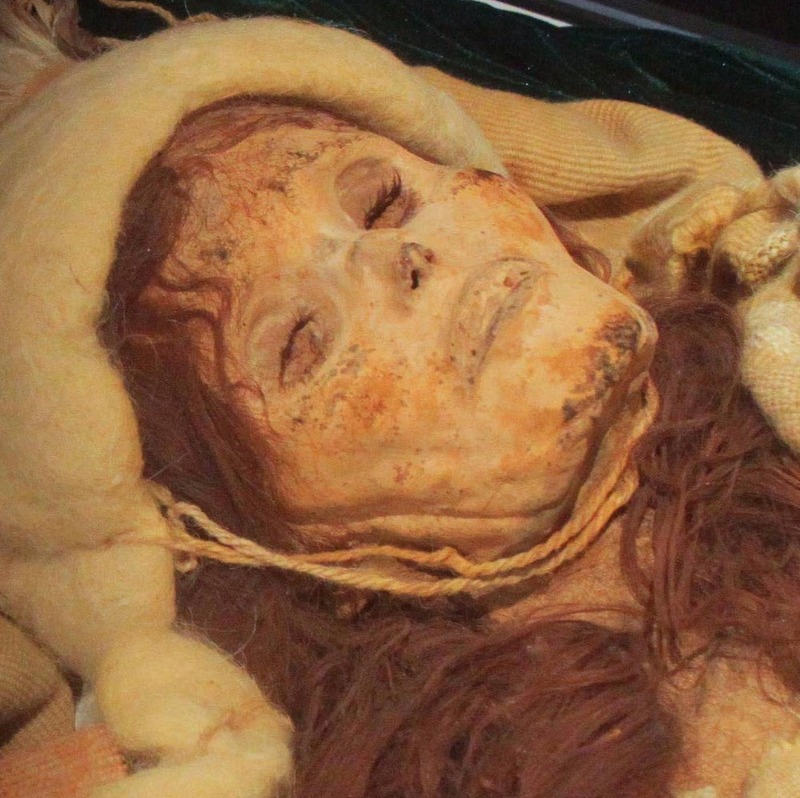 One of these mummified bodies, nicknamed the “Beauty of Xiaohe”, must have been a stunningly beautiful women when she was alive. Her body has survived even down to her delicate eyelashes. The cemetery was discovered in the early 20th century by a local hunter named Ördek. 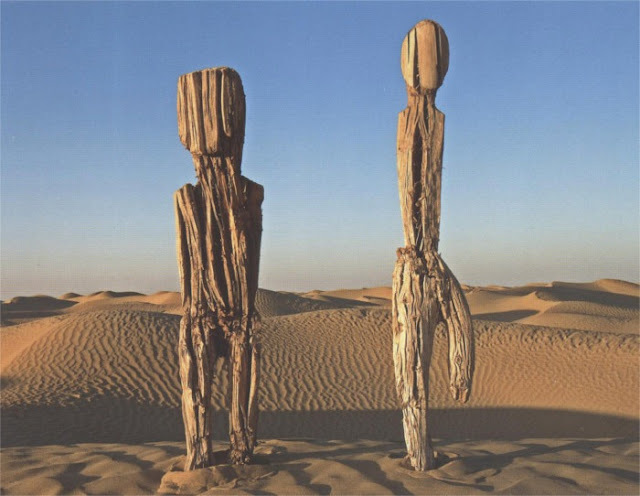 The Uighur hunter was wandering through a patch of the inhospitable desert when he stumbled across the forest of wooden poles with human bones and ancient religious artifacts littered around. Believing the place to be haunted, he hurried away never to return again. Decades later, a Swedish explorer and archeologist, Folke Bergman, was poking around the region looking for ancient ruins related to the fabled Silk Road when someone directed him to Ördek. Ördek explained to Bergman how to find the cemetery but refused to go with him. Bergman managed to find the site anyhow and named it Ördek’s Necropolis. Bergman excavated about a dozen bodies, and recovered some 200 artifacts. He left a fairly detailed account of his findings in the book Archaeological Researches in Sinkiang Especially the Lop-nor Region. The entire book can be read online now in the digital format. Bergman noted the unusual shape of the coffins, which looked like overturned boats. After placing the dead in these overturned boats, they were carefully covered with cowhide and buried in the sand along with straw baskets containing wheat and other food grains. Wooden stakes were then driven into the ground. The entire site, Bergman wrote, was littered with oar-shaped wooden monuments and wooden human figures. The cemetery was nearly forgotten until the early 2000s, when Chinese archeologists conducted an expedition to the site. They found that Bergman’s discovery was far more remarkable than initially thought. Archaeologists found hundreds of bodies buried five layers deep, along with intact mummies—the oldest and best-preserved mummies in the Tarim Basin area of China. "Never before have such a large number of mummies been found in a single site anywhere in the world," said Idelisi Abuduresule, a researcher and head of the Xinjiang Cultural Relics and Archaeology Institute. Archaeologists also discovered miscellaneous large wood-carved figures and animals, small wooden masks, and wood carvings of male and female genitalia, among other things. The Ördek’s Necropolis was now called the Xiaohe Cemetery, after a dry river nearby. But archeologist prefer to call it the Small River Cemetery No. 5. One of the more interesting finds is that although the cemetery lies in China, the corpses have strong European features with brown hair and long noses. 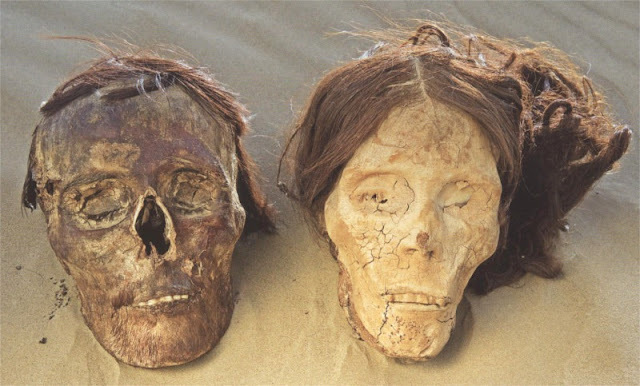 Genetic analyses of the mummies showed that the maternal lineages of the Xiaohe people originated from both East Asia and West Eurasia, whereas the paternal lineages all originated from Europe. Archeologists believe that the European and Siberian populations probably intermarried before entering the Tarim Basin some 4,000 years ago. The Tarim Basin was already dry when the Xiaohe people entered it forcing them to live at the edge of survival until the lakes and rivers on which they depended finally dried up around A.D. 400.